Anyone else out there have a thing for magnets? Like, every time you see them, you want them. Or you look at something and think, “Oh, I could make a magnet out of that.” Yeah, I wonder if there’s a support group for it. ‘Cause I’ve got some issues. Some time ago I had written that my grandparents moved in with my mom and told me they wanted me to take anything valuable. Being the sentimental sap that I am, I quickly took anything and everything that had meaning to me–namely, my grandmother’s brooches. I thought it was such a personal item that I would cherish for years. Her brooches and my grandfather’s collection of fedora hats have always intrigued me. It’s a tangible reminder of a more formal time period that doesn’t seem to exist anymore. Trying to figure out what to do with them/how to display them/how to do them justice, I simply did nothing for months. But THEN…I came up with an idea. Why not turn this little $7.00 beauty into a framing piece for the brooches, yet still be reminded of my grandmother while using them? Brilliant, Chris. Want a tutorial? Good “cause I’m gonna give one. I went to Lowes and purchased a piece of sheet metal in the plumbing department. I laid the frame backing over it and cut the measurements with a utility knife. They have fancy schmancy scissors that cut sheet metal, but I used an old pair of scissors I had around the house. It worked perfectly. It was a scary moment, but I took some wire cutters and cut the backs off of each pin. No going back now. They offer a wide variety of magnets in craft stores, but NONE of them work like the ones below. Trust me—I’ve wasted some money figuring that out. These babies are strong! I glued them on with some E-6000 glue. Also very strong! Spray painting the sheet metal black helps the brooches show off their color better (I think), and it turned out beautifully. Another treasure that came with me was my grandmother’s recipe box. It’s full of hand-written family recipes, and I just love it! There’s just something about hand-written items. I paired it with a couple of my favorite pictures of them called it good. I love neutrals, but the color in this project has me smitten. The moral of this story? Don’t be afraid to show off family treasures in a non-traditional way. I think about how long these beauties remained hidden simply because I wasn’t thinking “out of the box”, and it’s so disappointing. So go forth and rethink those heirlooms that have been stored away for too long. OMG that is so special- what a great idea! I made a formal gown with my Nans broaches & My pop gave me his collection of Fedora Hats too! Soo pretty! Love that you found a way to use always and everyday your grandmother's broches (they are all beautiful)! Love it! Where did you get the magnets? I've been trying to find good strong ones but I didn't want to waste money on junky ones. Love it – my grandma was an amazing seamstress so I made magnets out of some of the buttons I remember seeing in her sewing room when I was young. Just a happy little reminder of her for me. Cute cute picture of you with them too! such a great idea! My great-grandmother had a ton of brooches, all similar styles to what you show. I wore two of them on my wedding day, but they are just sitting in a jewelry box otherwise. I really love this idea of displaying them!!!! Oh my! I'm soooo in love with this idea, you are a pure and simple genius! My grandma must have been from the same era as yours. Even the handwriting on the recipe card looked similar. Last March, my relatives and I divided up some similar broaches. I like this idea. What a wonderful way to display part of your memories. This is such a great idea. I really loved your comment about these coming from a more formal time period. This is such a true statement, I think I grew up in the wrong time period. I would have loved wearing these and hey I just may find some of my own and do that anyways. Thanks for sharing this great project. I love old brooches – even wear them sometimes. I usually pin them up on something as decoration. Yours is a lovely way to display memento's of your family. Ooo I love the brooches and color of the frame! Genius and gutsy! (I might have just cut the pin off one to see how it works first, lol. )Turned out beautiful though. Love the way you used it in a modern way as well as making a simply magnet more glamourous! My sister died two years ago and left a lot of jewelry. I too inherited many brooches. I use them for my tablescapes since I like to pin fabric around the chairs and accent it with a brooch or use them on the napkin rings. Sometimes, I just wear them too. This is much too fab! I have enough trinkets and brooches to magnetize! Great idea! Loving the lighthouse on the sweater! What a great way to be able to see and enjoy them! I love turning old brooches in to new items. I noticed that you didn't use the oval blue one. That one is gorgeous! It would make a great ring or necklace. Chris I have been verrrry sick and haven't been on line to see your latest postings. What a cherrie and wonderful surprise to see Mom's broaches displayed in such a heartfelt way. Can't wait to show pop what you've done with them. Good job!! LOVE what you did with these. What a great way to always be reminded of a special person in your life. I may have to steal this idea! That is a awesome idea and definitely one I plan on doing! What a beautiful way to save a memory! That frame is the perfect backdrop for such pretty baubles! Gorgeous. Those are gorgeous! Beautiful job! I love the frame and what you've done with it! It really makes the brooches pop! OMG I love this idea! And I am in LOVE with that frame!!! what a great idea!!! love the frame color as well! You are so clever, much better than leaving your grandmothers broach's in a jewelery box. I also love handwritten notes and recepies. Thanks for sharing. Love the Hot Pink frame one of my favorite colors. Those brooches are beautiful. Great idea!! I love this idea. I searched Lowe's but didn't find the magnets. Can you share where you find yours, please? That frame is GORGEOUS! Where did you get it? Hi all! The frame was from a consignment store (painted it pink) and the magnets can be found at Hobby Lobby and Michaels! What a wonderful project! And so meaningful too. I made my wedding bouquet last year from family brooches, mainly my grandmothers. My grandmother's jewelry box was my favorite place to play when I was little. It held so much colorful, cool stuff! This would be a great idea for me. Thanks!! Very cute-Love the pink frame. Great way to have a reminder of your Grandmother! These are beautiful broaches. Have you seen the bridal bouquets made out of these? They're absolutely gorgeous. I've also seen them used as shoe clips on dressy shoes & they're very pretty too. I have been doing this for awhile I love it because they are so pretty but I don't want to wear them. I look for them at garage sales too so I can make more magnets! Oh my gosh, what a great collection (luckyyyyy)! I'm not sure if it's any easier, but I've used magnetic spray paint before and it works great as well. What a beautiful project! I love that it has meaning to you and you turned into such a productive and sentimental idea. And Ilove the color of the chalkboard too – so pretty! Love this idea!! Simply love it! I have to share on my FB page! It is just amazing! You could wear some of them too, vintage jewelry is very trendy! Love this idea!! Your brooches are beautiful! What a great idea. I really love this. 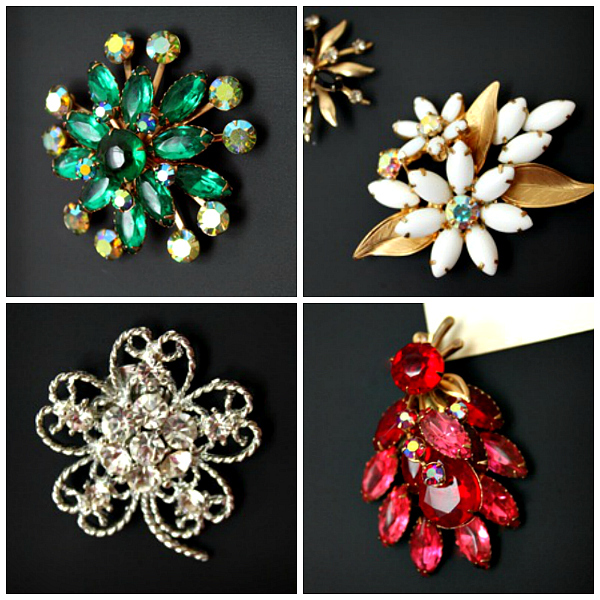 I just inherited a bunch of my great-grandma's brooches as well – I may just do the same thing! Absolutely gorgeous!! Love love love that pink!! What's the name of the color? that's brilliant and so beautiful. love all the colors! What a fabulous and beautiful way to remember your sweet grandma. What a genius idea! Love the color too. Very pretty. I saw people are using old brooches to create wedding bouquets instead of using flowers. I think that would be an awesome idea too. How to do it? No clue! Such a creative idea! Love this! Just found your blog. Love it! Very cute idea! Love the handwritten recipe. Its funny that older people's handwriting all looks very similar, yet people now have very different styles of writing! Wow! Now that's thinking outside the box! Love it!!! I have an old brooch just waiting for this! I would love to feature this on my site Reduce, Reuse, Upcycle. Wonderful idea. I have some sentimental brooches too. Don't know if I am brave enough to take the backs off. I did buy a gadget that would turn them into a necklace though. But love the idea of display. I love this idea. I have a broach that belonged to my great aunt. She wore it at my wedding, and it was the last time I saw her smile so much. She was sick with Cancer and passed away less than a year after my wedding. I am so grateful for it, but, like you, I am not a broach wearer and so it sits unused in my jewelry box. I am going to try this idea! I love the way you honor your grandparents memories, I am sorry for your loss, I just saw the post about losing your grandma. God bless! Brilliant! I left the fancy jewels to my sisters and swooped up all my grandmother's brooches. I can't wait to bring them out & inspire me in my studio everyday. This is genius! I love it! How amazing! I have boxes of them from my grandmother! Thanks so much for sharing! I think I saw this idea on the Nate Berkus show a while back. I was so glad when I saw that someone has exactly what materials to use and everything. Thanks for this posting. I plan on using your material idea for Christmas presents this year. I just wish I own old brooches instead of having to buy them at a consignment shop at $5.00 a piece! I LOVE this…but what i really want to know is where did you get this frame, i have the hardest time finding ornate frames. I don’t have very good luck either, Ashley. I found it at Salvation Army a couple of summers ago. It’s plastic, but I love the detail. Good luck! LEAH!!!!! You found me. 🙂 Uhhhh…I have a blog. Welcome! Gosh, I love you! LOVE YOU TOO CHRIS!!!! SO MUCH!!!! SO wish we lived closer to each other! Your house is AMAZING! It looks like the pages out of a magazine; just beautiful, much like you. Lovin’ your blog too! I love this idea! I have a few questions though, did you have to put a sealer over the painted sheet metal? Did you just use regular spray paint? Did you have to sand it first? I didn’t seal it, Kendra, and I should have. I have to move the magnets rather gingerly in order to keep it from scratching. I would definitely recommend it! And yes–I just used regular spray paint, but no sanding. Good luck! Thank you! Where in the world did you find that frame? I have been looking and looking for something just like it. This is so genius! I found it at Goodwill for $7.00. They’re not easy to find, are they?! Good luck! I found them at Hobby Lobby, but as the post says, you can find them at most craft stores. Good luck!